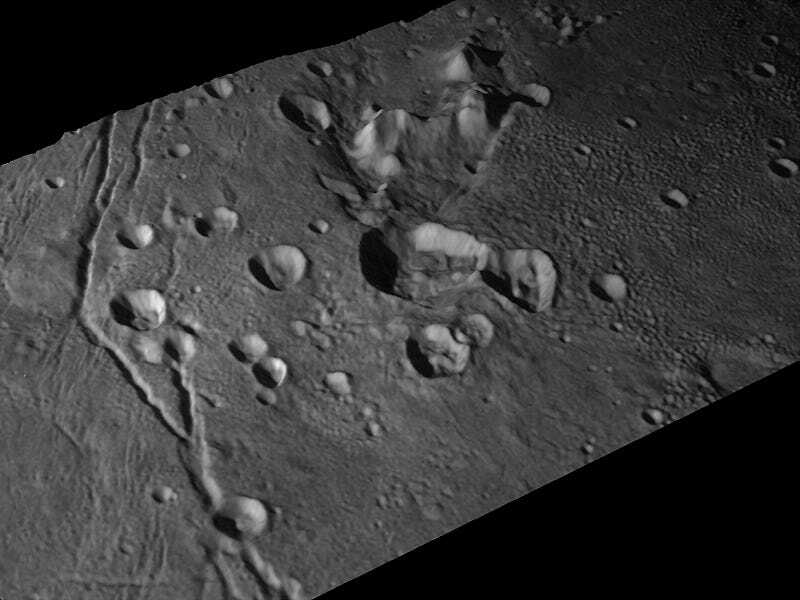 By meticulously stitching together photos taken from two cameras aboard the New Horizons spacecraft, a team of scientists has compiled the most accurate maps of Pluto and Charon to date. We’ve seen photos and maps of Pluto and Charon before, but these maps now represent our best current understanding of the surface features and topology of these distant Kuiper Belt objects. When New Horizons flew past Pluto and Charon on July 14, 2015, it snapped photos at a feverish pace with its two onboard cameras, the Long Range Reconnaissance Imager (LORRI) and the Multispectral Visible Imaging Camera (MVIC). A research team led by Paul Schenk from the Lunar and Planetary Institute pooled these photos together to create an overall mosaic of these distant worlds. A 3D perspective of Tenzing Montes, Pluto’s tallest mountain range. It proved to be a time-consuming and laborious endeavour, requiring the researchers to piece the scattered images together like a gigantic jigsaw puzzle. The work was performed over a two-year period as the data from New Horizons slowly trickled back to Earth. “It was quite an effort to line up the maps and make them accurate,” Schenk told Gizmodo. “Part of the problem is that we didn’t get all the data at once. New Horizons transmits over a slow radio link, so we received about three to four images at a time. This meant that we had to completely revise our data every few weeks. Schenk’s team, in addition to creating global maps, made topographical maps of both Pluto and Charon, which they did by analyzing stereo images captured by both cameras. The new global map of Pluto. The resulting global image and topography maps were archived at NASA’s Planetary Data System, and they’ll soon be made available to the public. In the meantime, the details of this research can be found in the latest edition of the science journal Icarus (new maps of Pluto here, and new maps of Charon here). The maps offer the best resolution we have for each geological area, showcasing the rich tapestry of surface features on both Pluto and Charon. 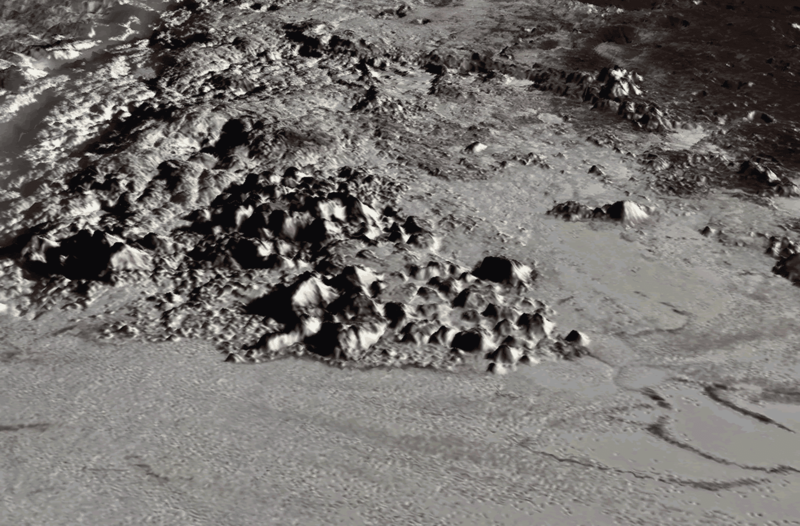 Take Tenzing Montes, for example, a stunning mountain range on Pluto. Located along the southwest margin of Sputnik Planitia—a vast plain comprised of frozen nitrogen—this mountain features steep cliffs, some at angles reaching 40 degrees or more. It’s about 3.7 miles (6 km) in height, making it comparable to Alaska’s Mount Denali or Tanzania’s Mount Kilimanjaro. Tenzing Montes is packed with rigid water ice, allowing it to maintain its heights. Other ices on Pluto, like methane and nitrogen, would be too weak, causing such a tall structure to collapse. The topographic maps are also painting a picture of Sputnik Planitia itself. Its expansive ice sheet measures 1.5 miles (2.5 km) thick on average, and its outer edges go really deep—about 2.2 miles (3.5 km) below Pluto’s “sea level,” or mean elevation. A view of craters and a group of mountains on Charon. The largest craters are about (30 miles) 50 km across. As for Charon, it’s a moon of topographical extremes. This moon has huge depressions near the north pole, some extending down for 8.7 miles (14 km), which is deeper than the Marianas Trench in the Pacific Ocean. Charon also features an equatorial trough that extends upwards at a height of 5 miles (8 km). Mountain ridges and volcanic plains on Pluto’s moon, Charon. “These and other features make Charon the most rugged mid-sized icy satellites other than Saturn’s high-contrast moon Iapetus,” said Ross Beyer, a research scientist at the SETI Institute in California and a co-author of the new study, in a statement. The new global map of Charon. Importantly, these maps are only partially complete. New Horizons only managed to image about three-quarters of the surface of Pluto and Charon. A good portion still remains a mystery. All the better reason to launch another probe into the Kuiper Belt.